The author of America’s largest career advice newsletter coaches you to achieving your best performance in job interviews, without gimmicks or agony, in a quick 90 minute read. Interviewing is healthy in an economic system without loyalty. It’s a very strong economy in 2018 and great opportunities abound. Cenedella walks you through the importance of understanding how to interview well in an economy without loyalty. You never know when your company or position will be in jeopardy and interviewing well is lifestyle insurance for your family. 49 interview questions they’ll ask you. Cenedella explains the rising popularity of behavioral interviewing and what it means for your job search. He walks you through, step by step, seven categories of behavioral questions and provides detailed insights into how your answers should position your candidacy for success. 25 questions you’ll ask them. Active listening is a critical skill for understanding your interviewer’s needs and succeeding in the interview. Cenedella details 25 questions you can ask any company, and any hiring manager, to gain the insights you need into a company’s operations and culture. By arming you with all the questions you’ll ever need in a job interview, he advises that you should never run out of questions with an interviewer, only the time to ask them. We were born in tribes, and we work in cubicles. Cenedella shows how interviewing is, by its very nature, a strange and uncomfortable experience. Interviews are a relatively recent development in business history and confound humans’ social expectations. He explains how your interview anxieties come from your human nature -- no one is “bad” at interviewing because humans weren’t designed to perform well in situations with strangers. And he shows you the specific steps to take to overcome your interview anxieties through preparation and familiarity. Are flip-flops optional? Cenedella reviews best practices in dress code, manners, and follow up for professionals interviewing in 2018. He describes the Visual Interview and what it can reveal about your future employer. And he guides you through an effective thank you process. 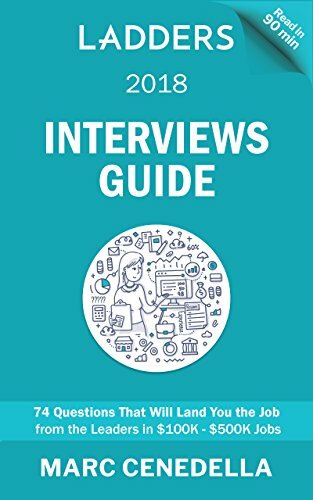 Ladders 2018 Interviews Guide presents an effective, tested, expert guide to interview success from the leaders in $100K - $500K jobs. Author Marc Cenedella wrote America’s largest career advice newsletter for 15 years, reaching 10 million people weekly. A nationally renowned career expert, his insights into successful interviews are based on data and learnings from helping millions of Ladders members connect with professional success in their careers.